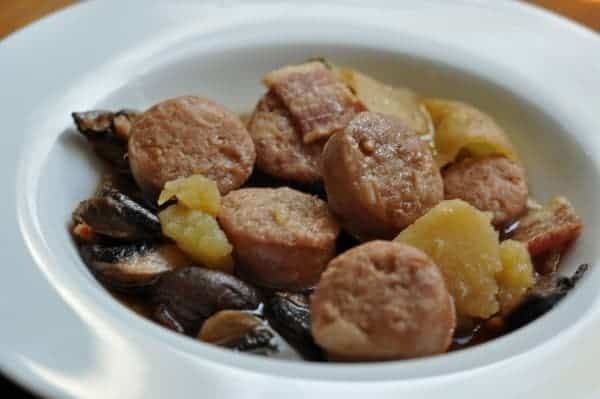 Home » Copycat Restaurant Recipes » Annie Gunns Irish Coddle – this Irish stew is filled with bacon, sausages, beer, potatoes, and more. Annie Gunns Irish Coddle – this Irish stew is filled with bacon, sausages, beer, potatoes, and more. Annie Gunns is located in St. Louis, Missouri. This Irish stew can be served with hot bread for a hearty meal. I think this soup would go well with some Irish Soda Bread and some of the Ragalin Road Guinness Dipping Sauce. This stew is hearty and full of meat, this dish will definately satisfy the meat lovers in your home. Make this Irish stew is filled with bacon, sausages, beer, potatoes, and more. Preheat oven 350 to degrees. Quarter the potatoes, and blanch until just tender. Grill the slab bacon and pork sausages (this can be done in the oven). In a small pan sauté garlic, onions, potatoes, and mushrooms. Place the sausages, bacon, and vegetable mixture in a roasting pan or a casserole dish add the broth and Guinness stout and bring to a simmer. Cover and bake 1 hour in conventional oven finish with thyme, salt, pepper, and butter. Serve as a stew with Irish soda bread. I served this soup with a pot of beans! My husband just dumped his beans in with the soup! We really enjoyed this soup and I even made it when we had company. Everyone wanted the recipe!